1. Preheat the oven to 180°C, gas mark 4. Place 4 egg yolks (use the remaining 2 for a different recipe) in a small saucepan with the milk, cornflour, cocoa and 100g of caster sugar. Warm over a medium heat, whisking continuously for 3-4 minutes, or until the mixture starts to thicken. Add the chocolate, and whisk in for a further minute until the mixture is very thick. Transfer to a large bowl and leave to cool. 2. Meanwhile, brush 6 x 250ml ovenproof ramekins with a generous amount of butter in upward strokes, to help the soufflés rise. Coat with the remaining caster sugar, tipping out any excess. Place in the fridge. 3. Place the 6 egg whites and cream of tartar into a large clean bowl, and whisk until stiff peaks form. Beat the chocolate mixture until smooth. Fold a quarter of the egg whites into the chocolate to loosen it, then continue with the rest in three batches. Spoon into the prepared ramekins, then run a finger around the inner edge of each dish, leaving a 0.5cm rim. Gently place onto a baking tray. 4. Bake in the oven for 15-17 minutes, or until risen. Meanwhile, make the sauce by pouring the cream into a small pan and heating until steaming. Remove from the heat, add the chocolate and stir until smooth. Mix in the yuzu juice to taste, to cut through the richness of the chocolate. 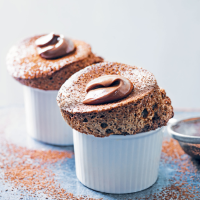 Serve the soufflés right away, sprinkled with finely grated chocolate. At the table, make indentations in the tops and pour the sauce into the centre.